Aviapartner is one of the leading and award-winning independent providers of ground handling services across 37 airports in 6 European countries. They employ over 6,000 staff serving the needs of 30 million passengers. Behind the scenes, Aviapartner’s cargo handling crew moves approximately 1 million tons of cargo per year. While Aviapartner was initially satisfied with their IT capabilities, they were looking to upgrade their operational flexibility while also reducing costs. Their IT structure was fully deployed on Citrix, but they found this to be a cost-inefficient solution. With a help from AltoGee, they chose to try Awingu deployed on Microsoft’s Azure platform. Anouar Ouali Alami, Vice President of Planning and IT at Aviapartner, pointed out the far-reaching cloud challenges that any international transportation organization faces. “Mobile working on any type of device is crucial to our business. We operate in a line of business where people need mobile access to their core applications and data, be it ground staff in the airport terminal or management on the road.” At first, Aviapartner fully deployed Citrix, but soon it became clear that Citrix didn’t mean their needs financially nor when it came to platform flexibility. 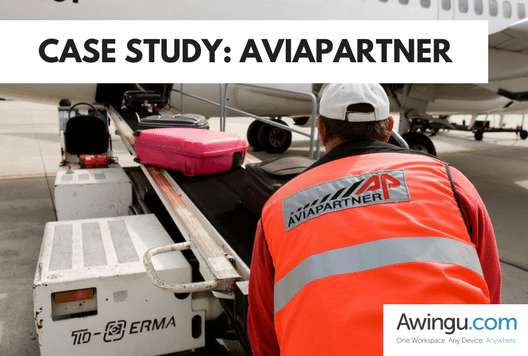 After consulting with the strategic advisor and partner AltoGee, Aviapartner found Awingu to be a perfect match because they are platform agnostic, enabled GDPR compliancy and had significantly lower costs in comparison to Citrix. Furthermore, Aviapartner needed flexibility in their IT solution. Aviapartner’s staffing can fluctuate heavily depending on the season. In peak periods, their staff can easily double. Awingu’s concurrent-user based licensing model neatly solved any variance in staffing. As the company currently supports over a dozen different devices from their airport based terminals. Aviapartner required a solution that is completely platform agnostic and mobile to improve their day-to-day operations. By embracing a more cost-driven approach, Awingu was able to bring the ease and convenience of platform agnostic mobility to Aviapartner, and delivers everything they needed — legacy and cloud apps, documents, and data — to stay productive. Users can access all their applications and data from virtually any device, anywhere. All that’s required is an internet connection and HTML5-capable browser — there’s no configuration or client software installation necessary. To further improve user experience, Aviapartner decided to adopt Awingu’s built-in One-Time-Password solution and phase-out the use of physical MFA (Multi-Factor Authentication) tokens. Since implementation, Awingu has made immediate and impact results on Aviapartner’s day-to-day operations. Because Awingu’s onboarding process requires zero configuration and zero client software installation, Aviapartner has become more flexible, mobile, and successful, all at the same time being impressed with the amount of time and money saved. Awingu’s transparent and affordable licensing for quality service meant that every Aviapartner employee, seasonal or otherwise, was instantly able to connect. “Aviapartner’s workforce is quite dynamic during our peak season, so it was important for us to choose a solution that offers flexibility with its licensing model. Awingu helped us achieve this flexibility. I would advise other companies to use Awingu’s platform, mainly for cost reasons. The economic model is quite interesting and it helped us to achieve major savings. And it’s platform agnostic,” concludes Anouar Ouali Alami. Check out more about this reference case at https://www.awingu.com/aviapartner-deploys-awingu-perfect-alternative-citrix/.